The faithful of the underground Church are frustrated by the Holy See’s “overlooking” them. There have been no underground bishops, but only apostolic administrators, for almost 20 years. In the eyes of the faithful, this decision is a kind of death sentence for their communities. "Embraces", meetings and souvenir photos with the pope for officials; no meetings or blessings for underground priests, and bishops. The question of registration to the Patriotic Association. An official bishop: "We are all puppets. We just do what they tell us to do". A double defeat for the Vatican and China. Rome (AsiaNews) - There is a widespread "despair", "bitterness", and even "anger" among the underground community of the Catholic Church in China. Underground communities are those who in the name of religious freedom guaranteed in the Chinese constitution, reject all the controls put in place by the Government on religious personnel, places of worship, activities, teachers and texts to be published and read. Above all, they refuse to sign up – and this is part of the conditions imposed by the government – to the Patriotic Association (PA), whose statutes outline a national Church independent of the Holy See, because it is against the Catholic faith. According to some priests, it was this "desperation" that pushed Fr. Dong Guanhua (underground priest) to be ordained illicitly, publicizing the announcement of his ordination along with his phone number and offering to ordain other bishops without the Holy See’s mandate. The incident is very ambiguous (Fr. Dong’s mental health; the doubts of those who ordained him and when; the questions about who is the real instigator of this episode: whether it is someone in the underground Church or some government spy trying to humiliate all underground Catholics). The fact remains - demonstrated by the many comments that are on the internet - that the faithful of the underground Church are frustrated by the Holy See’s "oversight" toward them. Some of them point out that for at least 20 years the Vatican has failed to appoint a successor when an underground bishop bishop dies, but at most indicates a priest as an apostolic administrator. In the eyes of the faithful, this decision is a kind of death sentence on their communities and dioceses. This has given rise to their "desperation". Especially since at the same time, they see that the Vatican approving episcopal candidates who have already registered with the Patriotic Association, while rejecting it as "incompatible with Catholic doctrine" is by Benedict XVI as Pope Francis. The recent news of an "imminent" agreement between China and the Holy See, of the "imminent" removal of the excommunication and reinstatement of the eight illegitimate official bishops (some with wives and children) exacerbate this sense of frustration. Some accuse the Vatican of using "double standards", embracing official bishops and priests while being completely indifferent to and even marginalizing unofficial ones. A young priest from the underground Church in the center of China noted that for many groups of the official church, who go as pilgrims to Rome, the Secretary of State does all it can to help them meet with the Pope and even to take a group photo. 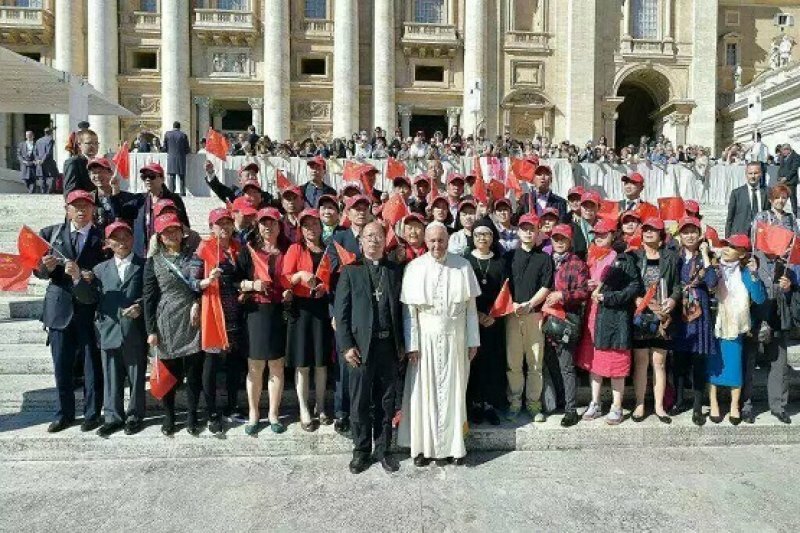 For example, on 5 October in St Peter's Square, a hundred faithful from the Diocese of Suzhou (Jiangsu) took this picture with the Pope and with their Bishop Msgr. Joseph Xu Honggen (see photo). Now Msgr. Xu is a great bishop on his own merit, recognized by the government and the Holy See. However, it is virtually impossible for a pastor to be pictured alongside the Pope of Rome without a prior concession from the Patriotic Association. The well-publicized occasion frustrates underground Catholics who, when they come to ask to speak to the Pope of their situation, are beaten back. A priest who for months had been asking for a papal blessing for his bishop in Henan, who was marking 25 years as bishop - often very difficult, under police surveillance and house arrest - was sent packing empty handed. "My bishop – he confided - has undergone persecution and faced difficulties to defend the faith and his loyalty to the Pope in all these years. Now they won’t even give a sign of support and encouragement to those who need it most. This makes us feel very lonely. " "Feeling lonely," "abandoned", "forgotten" is a refrain frequently heard among unofficial Catholics from Heilongjiang up to Xinjiang and Inner Mongolia to Guangdong. Of course, the Vatican, in an attempt to bring the Pope to China and to reach an agreement on the appointment of bishops, and (in the future) diplomatic relations, is very cautious not to give in to some Chinese critics who might accuse it of "meddling in China's internal affairs under the guise of religion ", even supporting persons who commit acts outside the government's control and therefore - according to Beijing -" criminals. " In addition, as if to avoid any friction with Beijing, the Vatican has decided to stop listening to Card. Joseph Zen, bishop emeritus of Hong Kong, champion of religious freedom in China and "spokesman" of the underground Church. Even the mission entrusted to Msgr. Savio Hon, a Salesian like Cardinal. Zen, the only Chinese in the leadership of the Roman Curia, secretary of Propaganda Fide, sent to Guam in recent months, is seen as a move away from the Sino-Vatican negotiating table. It must be said that underground bishops would be willing to register with the government and the Ministry of Religious Affairs, but not to the Patriotic Association, given its "incompatibility with the Catholic faith". Instead the government - in Henan, Anhui, Shaanxi, ... - obliges registry with the Patriotic Association. And even when it promises the bishops that they will be only registered with the Government, automatically supplies them with a membership card of the Association. To belong or not to the PA is a crucial fact. Not only it submits bishops, clergy and faithful to suffocating controls, with heavy interference in the appointment of bishops, in the positions of the priests, in the assessments on young people's vocations, it also drags the bishops away from the diocese and from their pastoral work for months, to "bring them on vacation" and indoctrinate them. In fact it was an official bishop, with a very high role in the PA who confessed to us: "We are all puppets. We just do what they tell us to do. " Because of that, even if the Vatican is in agreement with Beijing on the appointment of bishops and gives an indication on the registration of priests, many underground communities have already declared that they will not do it because of conscientious objection. This is not in "disobedience to the Pope," as some commentators have improperly claimed, but a final attempt to safeguard the freedom of the Gospel from being engulfed in a state and political structure, that has nothing to do with faith. It is likely that a possible agreement between Beijing and the Holy See will not give any indication on belonging to the PA or not, leaving the bishops and priests free to choose within the margins of religious freedom conceded to them. Thus underground Catholics will continue their lives full of risks and possible imprisonment, but without submitting to the PA. However, this would be a defeat for the Vatican, at least temporarily: in the first attempt at a longed for dialogue with China, it has failed to wrest a minimum freedom for all the faithful, in view of a future, real, peaceful reconciliation of the two communities, the official and underground. But it will also be a defeat for the Chinese government with the further frustration of its obsession with control. According to some observers, the over- publication of an "imminent agreement" is the result of Beijing’s so-called "soft power" which it uses to intimidate Taiwan, restless underground communities and drive the Vatican to sign a hasty agreement to hem in the experience of the underground Church, putting the whole Church in the hands of the government and its control. These two "losses" are not painless: they have generated widespread distrust in the government and the Vatican among the official and underground Catholics, and there is the risk that before distasteful political agreements, the faithful will take refuge in more ways private to live their the faith. This situation, however, is also an opportunity to help the Church in China not with political dialogue, which closes off entire portions of the Christian community, but in strengthening relations of communion, of friendship, cooperation and especially formation. Diplomatic agreements can wait. In one of the last conversations I had with the heroic Bishop Anthony Li Duan of Xian, who died in 2006, he said: "There is no need to search for diplomatic relations at all costs between the government and the Holy See. Only when Beijing can guarantee full religious freedom to the Church, should we pursue diplomatic relations. Meanwhile, let us strive to build up the Church and to evangelize Chinese society".